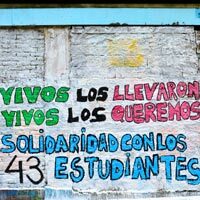 On Sept. 26-27, 2014, 43 students were kidnapped at Iguala/Ayoztinapa in the state of Guerrero. Parents of one student who remains missing and another who evaded being taken will share their experiences and also talk about the current human rights and migration issues in Mexico. There are two opportunities to hear from them on Oct. 31 at Webster.